SINGAPORE: LaSalle Investment Management said yesterday it has US$3bil available for investing in Asian real estate and is ready to re-enter the market after nine months on the sidelines, focusing initially on Japan and Australia. “The process of debt restructuring and market resetting and capital and economic stabilisation seems to be happening fastest in those countries,” chief investment officer for Asia Pacific Ian Mackie told the Reuters Global Real Estate Summit. “Japan has had a price correction that has been very significant (and) people forget that Japan is still the second biggest economy in the world,” he added. The US real estate investment firm, which has US$8.7bil in Asian assets, favours “gateway” cities such as Tokyo and Osaka in Japan and Sydney, Melbourne and Brisbane in Australia. MacKie said LaSalle’s US$3bil war chest, most of it from a fund raised around the middle of last year, would probably translate into acquisitions worth US$6bil as the firm planned to keep debt levels low. The firm, the investment arm of property services firm Jones Lang LaSalle, used to borrow up to 75% to fund an acquisition in Japan but will likely seek about 50% financing under current market conditions. Asian property investment sales fell sharply in the second half of last year, hurt by a tightening of credit markets and a collapse in investor confidence following the collapse of Lehman Brothers in September. For the first three months of 2009, investment sales fell 83% to US$3.1bil from a year ago, according to data compiled by rival property services firm CB Richard Ellis. The worst-hit markets were Japan, Hong Kong and Singapore. Mackie said LaSalle invested in most types of property but was keenest on warehouses, hotels and offices. Besides Japan and Australia, its other preferred destinations include China and South Korea. But the firm will probably give Indian real estate a miss as it feels the potential returns do not compensate for the risks. “We have not seen an attractive investment in India in terms of risk-adjusted returns ... We can get the same returns in Japan and the risks are much, much higher in India,” he said. LaSalle said that while it saw opportunities in Japan and Australia, it remained cautious about Asian real estate in the near-term and warned that a pick-up in home sales in China, Hong Kong and Singapore could be a “bear rally”. Kenneth Tsang, the firm’s Asia-Pacific head of research and strategy, said the spike in apartment sales was driven by pent-up demand and low mortgage rates and may not be sustainable. PETALING JAYA: YTL Corp Bhd will subscribe for up to 75% of the total rights units issued by Starhill Global Real Estate Investment Trust (REIT) under its proposed one-for-one basis. In a statement to Bursa Malaysia yesterday, the company said it had entered into a sub-writing agreement with DBS Bank Ltd, Merrill Lynch (Singapore) Pte Ltd and Credit Suisse (Singapore) Ltd for the purpose. Starhill Global REIT, which is listed on the main board of Singapore Exchange Securities Trading Ltd, has proposed to issue 963.72 million new units at issue price of 35 Singapore cents per unit. As at June 22, YTL Corp has an aggregate deemed interest in 256.1 million units, representing about 26.6% stake in Starhill Global REIT. SINGAPORE: Singapore's Starhill Global Real Estate Investment Trust yesterday proposed a rights issue to raise S$337.3 million (S$1 = RM2.43) to reduce debt and get new funds for possible acquisitions. The property trust, which is controlled by Malaysia's YTL Corp Bhd (4677), will offer shareholders one new unit for every existing share held at S$0.35 per rights unit - a discount of about 45 per cent to the last closing price of S$0.64. YTL, whose units own about 26.6 per cent of Starhill, will take up its entire allotment of rights shares and will subscribe for up to 75 per cent of the rights unit, the property trust said in a stock market filing. DBS is the sole financial adviser to the deal and the rights issue will be fully underwritten by DBS, Merrill Lynch and Credit Suisse. Starhill's assets include stakes in Wisma Atria and Ngee Ann City, two large malls on Singapore's Orchard Road shopping belt. Auto and plantation group Oriental Holdings Bhd (OHB) plans to open a RM200 million specialist hospital in Malacca in 2012 to strengthen its healthcare division. Called the Melaka Straits Medical Centre, OHB will hold a controlling 51 per cent stake in the hospital that will be located in the new reclaimed coastal tourist township of Klebang in Malacca. Boon Siew Sdn Bhd, the controlling shareholder of OHB, will hold another 20 per cent, followed by Bagan Specialist Centre with 29 per cent. Boon Siew also holds the majority stake in Bagan Specialist Centre which is located in Seberang Prai, Penang. "This 300-bed hospital will offer multi-diciplinary specialist healthcare services with niche specialisation in heart, lung and cancer treatment," OHB director Datuk Dr Tan Chong Siang told Business Times. Dr Tan said Malacca was chosen because land was available. The reclamation project there is handled by Ultra Green Sdn Bhd, a construction and property development subsidiary of OHB. The hospital is expected to create 500 new jobs. Construction is due to start in November this year. "We choose to expand at this time of challenging economic situation because we see the synergistic opportunity presented in a field we have been involved in for the past 22 years," said Dr Tan, who is also the medical superintendent of Bagan Specialist Centre. "It is a concept well received by the public from our track record, we believe we are ready now for expansion," he added. According to Dr Tan, the existing hospital, Bagan Specialist Centre in Seberang Prai in Penang, operates on the basis of good quality at minimum cost, minimum discomfort and optimum speed. It plans to do the same for the new hospital. In the year ended December 31 2007, Bagan Specialist Centre made a net profit of RM6.83 million on revenue of RM39.23 million. As for OHB, its net profit eased 3 per cent to RM314 million in 2008 while revenue was up 14 per cent to RM5.1 billion. KHAZANAH Nasional Bhd and its partner, Boustead Holdings Bhd, expect the indoor educational theme park, KidZania Kuala Lumpur, to be opened by 2012. Khazanah managing director, Tan Sri Azman Mokhtar, said the RM50 million theme park would occupy about 60,000 sq ft at the new building in Mutiara Damansara. "About 500,000 visitors are expected per annum," he told reporters after the signing of licensing agreement between Rakan Riang Sdn Bhd and KidZania SA de CV today. Rakan Riang is a joint-venture company between Khazanah and Boustead. Azman said the theme park was expected to create 400 jobs. He said the company would announce the entrance fees soon. Founder/chief executive officer of KidZania SA de CV, Xavier Lopex Ancona, said it cost between US$12 and US$13 to visit KidZania in Jakarta. KidZania is a family entertainment centre where children play adult roles in a child-sized replica of an actual city with streets, buildings, shops as well as vehicles moving along its streets. The first KidZania was opened in 1999 in the Santa Fe Shopping Mall of Mexico City. The others are in Japan, Indonesia and Portugal. Malaysian construction stocks including Gamuda Bhd, IJM Corp and WCT Bhd are set to benefit from several “fat years” as the government accelerates a slew of development projects, Maybank Investment Bank Bhd said. Prime Minister Datuk Seri Najib Razak is yet to award RM12 billion (US$3.4 billion) of contracts from two stimulus packages, Wong Chew Hann, a Kuala Lumpur-based analyst at Maybank, said in a report today. The first-quarter economic slump of 6.2 per cent underlines the need for faster project implementation, Wong said. The rollout of all outstanding contracts has the potential to trigger Malaysia’s first building boom since the Petronas Twin Towers and the Kuala Lumpur International Airport projects before the 1997-1998 regional financial crisis, Maybank said. Steelmakers, property developers and construction stocks are already among the year’s top climbers on the nation’s main index. IJM, helping to build a tunnel for an interstate Malaysian water project, has almost doubled in 2009 and is the second-best performer on the Kuala Lumpur Composite Index. Gamuda, jointly building a railway in the north of Malaysia, has surged 33 per cent. WCT has jumped 27 per cent. The government may hand out infrastructure projects valued at between RM8 billion and RM10 billion this year, followed by a similar total in 2010, Bank of America-Merrill Lynch said today after meeting executives at IJM and Gamuda. “The government will continue to spend, spend and spend,” Melvyn Boey, a Singapore-based analyst at Bank of America- Merrill Lynch, said in a report. Contracts awarded in the next 12 months to 18 months will have a “big multiplier effect” on the economy, Boey said. According to Maybank, the funds from Najib’s two stimulus packages will coincide with the acceleration of spending under a five-year government industrial plan, devised before the current crisis, which stretches through 2010. Najib has an additional RM103 billion, almost half the entire allocation, to spend before the end of next year, Maybank said. The biggest projects due by the middle of 2010 are the remaining components of a water-transfer project in central Malaysia, already partly awarded to IJM, that are probably worth a combined RM6.2 billion, Maybank said. The government will also award a RM2 billion contract to build a low-cost terminal at Kuala Lumpur’s airport, and order an extension to a railway network in the Klang Valley surrounding the Malaysian capital, a job that might be worth as much as RM10 billion, the bank said. Najib, who came to office in April and inherited the government’s smallest majority in more than 50 years, probably has only a 12-month window to implement the biggest projects in order to strengthen the economy before the next general election, due by 2013, Maybank said. SHAH ALAM: Muhibbah Engineering (M) Bhd sees better performance from its infrastructure construction business this year due to cheaper materials after the division posted losses last year. Nevertheless, the current general business environment remains slow and a pick-up in the construction industry is not seen for another six months, said managing director Mac Ngan Boon. Mac said the group’s infrastructure construction business was expected to perform better this year as raw material prices overall had decreased by 10% to 15%. “Last year was a difficult period as we had to endure high prices for raw materials and scarcity of equipment for our heavy engineering works. “Going forward, we see a trend reversal and that (will have a) positive impact on our ongoing jobs,” he told reporters after Muhibbah’s annual general meeting yesterday. The company’s infrastructure construction division registered a pre-tax loss of RM21.5mil in its previous financial year ended Dec 31 mainly due to increased costs in oil, construction materials, transportation as well as other operating costs. This had a negative impact on the company’s net profit, which fell to RM21.8mil from RM70.2mil in FY07, although revenue rose to RM2.1bil from RM1.4bil. “The secured projects also give us the choice to select projects that would be highly beneficial for the company and not just aggressively fight to get jobs,” he said, adding that the company had bid for jobs worth RM3bil for both local and overseas projects. “But the market environment is more competitive today,” Mac acknowledged when asked on the success rate of the jobs tendered for. Muhibbah’s order book for construction projects stands at RM2.6bil currently with 55% local projects and the rest goreign. On its crane business, Mac believes that demand will be more robust in the latter part of the year. The name Swiss-Belhotel International (SBI) may not ring a bell with most Malaysians, but it soon will. This Hong Kong-based hotel management company, which is yet to open its first Malaysian hotel, will by end-2010 operate some 1,800 rooms in Malaysia and create between 2,000 and 2,500 jobs in the market. It is also in talks with other developers that will lock another 1,000 rooms under its management by end-2011. Given the anticipated openings, it is not surprising that SBI's director of projects and developments for Malaysia Carlos Velho expects that Malaysia will be the largest profit contributor to the group in two years. "We are confident that Malaysia in the next two years will be the biggest net profit churner for the group," he said, adding that now the group's major contribution comes from Indonesia. SBI manages 26 hotels in 13 countries. Another 26 are under development. "We are negotiating for openings in Johor, Sarawak, Penang and Langkawi," Velho said, adding that it was close to signing on the dotted lines for all these deals. The new projects are either four-star or five-star properties with 300 rooms on average and are slated for opening in 2011 and 2012. Founded in 1987, Swiss-Belhotel today comprises Swiss-Grand (for five-star and boutique brands) and Swiss-Belhotel (for four- and five-star brands). In more recent years, it created Swiss-Inn and Swiss-Express brands for three- and two-star operations. The confirmed openings in Malaysia are Golden Palm Tree Sea Villas and Spa, Swiss-Belhotel Mont Kiara Suites and Residences, Swiss-Belhotel Zenith Kuantan and Grand Swiss-Belhotel Kota Kinabalu. Three hotels and a serviced residence are keeping Hong Kong-based hotel management firm Swiss-Belhotel International (SBI) awfully busy in Malaysia. SBI, which will open the five-star Golden Palm Tree Sea Villas and Spa Sepang in December 2009, is also working on three other hotel projects which are under development in Pahang, Sabah and Kuala Lumpur. In Pahang, SBI will manage a 515-room Swiss-Belhotel Zenith Kuantan together with a convention centre that can accommodate 6,000 people. The hotel, slated for opening in October 2010, forms part of the Putra Square Kuantan being developed by Zenith Aim Sdn Bhd. SBI's director of projects and developments for Malaysia, Carlos Velho, is excited about the project as he feels the opening will fill an existing void in the state capital - the need for a five-star city hotel with convention facilities. "There is no facility equal to this in Kuantan and its opening will bring the meeting, incentive, convention and exhibition business to the convention centre," Velho told Business Times in an interview. Accordingly, Velho expects occupancy to touch 80 per cent in the first year of operations - a commendable figure for a new hotel. It hopes to garner an average room rate (ARR) of between RM180 and RM230 per night. The project in Kota Kinabalu, Sabah is a 335-room sea-fronting five-star hotel. The hotel, to be named Grand Swiss-Belhotel Kota Kinabalu, is owned by China based i-Zenith International Pvt Ltd. This hotel forms part of the 1.22ha Kota Kinabalu City Waterfront integrated mixed development by Sunsea Development Sdn Bhd. The project will also house a 400,000 sq ft retail space and another 100 units of designer suites. 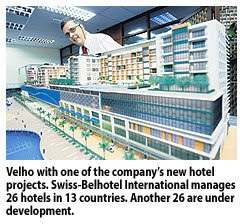 To be ready in December 2010, Velho expects this hotel to draw a foreign crowd who will help fill up its projected 70-75 per cent average occupancy in the first year. It hopes to achieve an ARR of RM350. The hotel complies as a green building, and thus expects that while cost of construction may be higher, its cost of operations will be lower from water harvesting and savings on lighting and air-conditioning (typically the highest cost after wages). In Mont Kiara, a 584-unit Swiss-Belhotel Mont Kiara Suites and Residences is being built by a public-listed company. 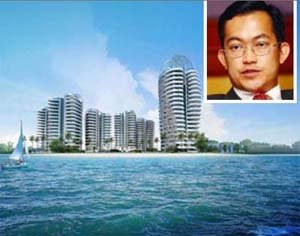 Meanwhile, The Golden Palm Tree Sea Villas development in Sepang will open its doors December 2009. Velho said that reception to the project was so good that it had to increase the number of villas to 399 from 366. The project guarantees a return of 8 per cent in the first and second year and to gradually improve from the third year onwards. The villas, which have all been sold, is leased back by the developer of the project Sepang Gold Coast Sdn Bhd's unit Sepang Duta Sdn Bhd. Sepang Gold Coast is a 70-30 joint venture between CNI Corp and Permodalan Negeri Selangor Bhd (PNSB). IOI Properties Bhd will be leveraging on the financial strength of its parent, IOI Corp Bhd, to build a greater presence in the Klang Valley and Singapore property markets. Since being taken private in April, the 95.33% subsidiary of IOI Corp has greater liberty to plan and decide on the direction and projects it wants to undertake. IOI Corp group executive director Datuk Lee Yeow Chor said although the level of activities would not change much from what the company had done previously, it was in a better position to leverage on the group’s financial strength to facilitate funding requirements for land acquisitions and move projects ahead. According to Lee, property is all about holding power and having the financial strength to hold out and mitigate against the prevailing challenging market conditions, including slow sales; are important for property companies. Despite the severe market crunch in Singapore since February last year, IOI Properties proceeded with the construction of its Seascape Collection residences on Sentosa Cove. The construction of the project has reached 40% to-date. The 1.44-ha Seascape project is a 50:50 joint venture between IOI Properties and its Singapore partner, Ho Bee Investment Ltd. It comprises two eight-storey condominium blocks of 151 units of various sizes, tentatively priced from S$2,500 to S$2,800 per sq ft.
IOI’s second project in Singapore, the Pinnacle Collection – which is 65%-owned by IOI Properties and 35% by Ho Bee – will be undertaken by Pinnacle (Sentosa) Pte Ltd. The 2.12-ha site was tendered for S$1.1bil. The 99-year leasehold land is the final piece of condominium land to be launched by Sentosa Cove and has a maximum permissible gross plot ratio of 2.6. The site will have seven 18-storey blocks and one 20-storey block of luxurious condominiums. It is one of the two condominium parcels flanking the entrance of the marina leading into Sentosa Cove. Lee said the launch of The Pinnacle would depend on the take-up for the Seascape residences. IOI has plans for a third project in the city state, comprising medium to medium high-end residences on a 1.44-ha site near Novena Square and Orchard Road. He said the company was closely monitoring the Singapore property market to ensure the timely launch of the projects to optimise their value. “The completion of the two integrated resorts in Singapore later this year will be the catalyst for further economic growth and market upturn in the city state,” Lee said. In the last two months, the market for medium to mid-high end property in Singapore had shown encouraging signs of an upturn, he added. Things are also looking up for the Klang Valley property market and demand is expected to recover by year-end. 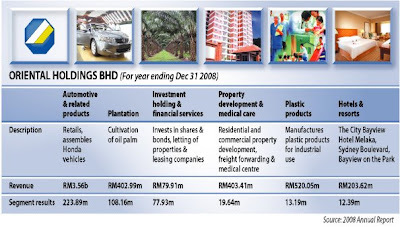 For the financial year ending June 30, 2010 (FY10), project launches worth RM580mil have been lined up in the Klang Valley, including in Bandar Puteri, Bandar Puchong Jaya and IOI Resort. A new greenfield development, Sierra Puteri, a mixed housing development on 194ha in the Seri Kembangan-Cyberjaya area, is also in the pipeline for launch in the first quarter of next year. There will also be a 22-ha commercial precinct in the RM2bil development. Lee expects the company’s property sales to bounce back from RM630mil recorded last year to RM650mil next year. This year, it expects to turn in sales of RM610mil. “We will also be placing more focus on investment properties. For FY10, we expect more than 15% of the company’s earnings to come from property investment and the balance from property development,” he said. Last year, income from property investment contributed 10% to the bottomline of IOI Properties and about 22% to 25% of IOI Corp’s earnings. General manager for group operations Lee Yoke Har said besides leveraging on the good location of the company’s land bank and strong branding, it also emphasised on good community relations and programmes to promote wholesome living and safe communities in all its townships. It set up a dedicated community website, Myioi.com, in 2000 that has become a popular communication tool for residents of its projects. Other initiatives include the IOI Privilege card, which is a discount card offered to residents when they patronise any of the participating outlets in the townships. “The next project to be rolled out will be free WiFi within our townships and ‘intercom connection’ for residents via the 015 IP phone,” she added. DEMAND for bricks – one of the main components in the construction of any building – was quite badly hit by the economic slowdown, but signs of improvement are showing, especially in Johor in recent months. Major brick manufacturers in the state are now starting to receive orders from contractors and buyers, not only in Johor but also from Singapore. Demand is also likely to get better in the second half of the year after a sluggish second half last year. The price for common clay bricks is now 25 sen to 27 sen each and it is largely determined by the location of the brick plants and the distance between them and the projects. It was priced at 35 sen when crude oil price was at US$110 per barrel in mid-2008 and also when demand for bricks started to decline. Batu Pahat-based Kia Lim Bhd executive chairman Datuk Ng Eng Sos told StarBiz the Federal Government had played a crucial role in helping those affected by the current global economic downturn. “The RM67bil economic stimulus package is helping to cushion off the effects faced by businesses and companies,’’ he said. He said new public projects such as schools, hospitals, government staff quarters and police stations would help construction-related companies sustain their operations. The private sector had already cut their spending in the second half of 2008 following the credit crunch in the United States and the financial crisis in Europe. The trend was likely to remain until year-end, he said. Construction-related companies were pinning their hopes on public projects due to the softening of private and commercial projects, he added. He said the company was also banking on the construction activities by both public and private sectors in Iskandar Malaysia to boost demand for its products. Ng noted that several projects were already off the ground or would be implemented soon in the country’s first economic growth corridor despite the slowdown. He said the assurance given by Prime Minister Datuk Seri Najib Razak that the Federal Government was committed to develop the area bode well for the construction sector in Johor. Ng said demand for bricks from Singapore was also positive in recent months as there were several ongoing major public and private projects in the republic. “Traditionally, buyers from Singapore will choose brick manufacturers from Johor due to the long business relationship between the two areas and their close proximity,’’ he said. Kia Lim is one of the few major producers of facing, common and paver bricks in Johor and currently has a 30% market share in Johor and Malacca. The company markets 80% of its products locally and exports the rest to Singapore. For the financial year ended Dec 31 (FY08), it registered net profit of RM3.65mil on revenue of RM59.6mil compared with a net loss of RM1.32mil on revenue of RM49.34mil in FY07. Another company, Claybricks & Tiles Sdn Bhd, sees equal demand for its bricks from the public and private sectors in Johor for this and next year. Managing director Dr Tang Hai Chiang said the supply of bricks was mostly localised as the product was sourced by buyers from the same states. “It has to do with the logistic and transportation issues as these two factors could determine the price of bricks in the market,’’ he said. Claybricks & Tiles is the largest maker of fine quality clay products in Malaysia, producing 10 million bricks monthly at its plant in Kota Tinggi. It produces facing bricks (60%) and common and paver bricks, and about 90% of its products are exported to Japan, Taiwan, Hong Kong, Singapore and the Middle East. “Common bricks are essential items in the construction industry and I personally don’t see any substitute,’’ said Tang. Like Ng, Tang said that demand for common bricks in Johor had improved much in the first half of 2008 and likely to get better in the second half. However, Tang said the prices in Malaysia were still low and the export business was good because of the abundance of raw materials and low labour costs. Tang said in the last 10 years there were about 400 common brick manufacturers in the country but 50% of them had since closed down due to stiff competition. In Johor there are only 10 left now. The construction sector in Johor has been showing positive signs in the last three months after experiencing a slowdown in the second half of 2008. Sin Sin Construction Sdn Bhd managing director Tan Wee Hiong said this was due to the implementation of new public projects in the state. “The government-led projects are bringing relief to the construction industry during the current slowdown as the private sector had cut its spending,’’ he told StarBiz. Tan hoped the relevant government agencies would be more efficient and swift in implementing the projects under the second stimulus package as they would benefit the construction industry. He also hoped that the private sector would not further cut their spending as both the public and the private sectors played an important role even during a recession. Banks in Malaysia had also played a major role by continuing to assist businesses and companies financially, Tan said, adding that low interest rates for housing loans offered by banks and special packages by housing developers also helped developers to launch new properties. Tan said the slowdown in the second half of 2008 had stabilised prices of building materials, including common bricks. He said Singapore also played an important role in Johor’s economic performance as both countries were closely linked economically. Despite the recession, there were several ongoing major public and private projects in Singapore and demand for building materials from Johor for Singapore customers was still “healthy”, he said. “When Singapore fully recovers, Johor will be the first to benefit as the city state needs more workers and Johor is traditionally the main supplier of labour there,’’ Tan added.